The Green Clean Schools Forum at ISSA/INTERCLEAN North America in Chicago in October was a new and exciting way for school facility directors to access to the premier cleaning event in the country. The two-day event was attended by more than 200 school facility directors, green cleaning experts, leading manufacturers and representatives from non-profits and NGOs. 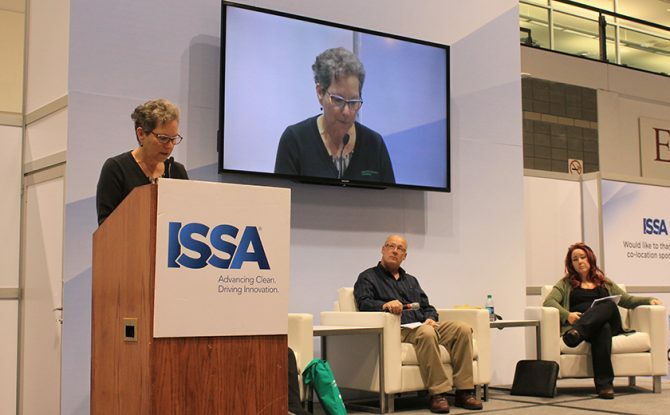 Attendees convened in a conference room at McCormick Place for educational sessions and networking, with access to all of the offerings at ISSA/INTERCLEAN, including the renowned trade show floor and VIP access at the event’s keynote speakers. “We were thrilled to welcome school facility managers as the vital members of the cleaning industry that they are,” says Rochelle Davis, president and CEO at Healthy Schools Campaign. ““We know that it takes leaders, on the ground, in schools and universities across the country to help steward these institutions down the right path.” The Green Clean Schools Forum was presented as part of a five-year partnership between HSC and ISSA, with the goal of building a network of school facility directors who are promoting green cleaning in their schools and communities as well as within education, government and the cleaning industry. On the first day, guests attended a series of in-depth panel presentations that took close examination of the 5 Steps to Green Cleaning in Schools, HSC’s comprehensive resource that outlines the components of an effective, healthy green cleaning program. Panelists included members of the Green Clean Schools Leadership Council as well as green cleaning experts. The opening remarks provided by Tracy Enger, from the U.S. Environmental Protection Agency’s Indoor Environments division, made a passionate case about ensuring that students and staff have the healthiest learning environments possible. At lunch, the father of green cleaning and HSC’s devoted green cleaning champion, Steve Ashkin, spoke about the need for strong leaders in the field of green cleaning in schools. Ashkin urged those in attendance to connect with each other and galvanize the movement to make schools everywhere healthier. Additional panels explored techniques for choosing greener cleaning products and equipment, including a tutorial on how to understand third party certifications to identify the healthiest choices. One panel looked at the ways leading programs and a K-12 district and a university have been engaging the entire community in their green cleaning programs. On the second day of the Forum, attendees heard speakers from some of the manufacturers that are committed to providing sustainable, green and healthy options for schools. Afterwards, a guided tour of the trade show floor allowed small groups of facility directors to interact directly with industry representatives, asking questions that were specific to their institutions and programs. For Mike Jones, a member of the Green Clean Schools Leadership Council who presented at the Forum and is the director of custodial services at Columbia Public Schools in Missouri, this was his first chance to visit ISSA/INTERCLEAN. “The Forum was a great opportunity to be at the show, to visit with my vendors and see new companies I hadn’t considered and look at their products,” says Jones. Many attendees, like Jones, had never been to ISSA/INTERCLEAN before. This event marked the first time that school facility personnel were given premier access to ISSA/INTERCLEAN, with programming focused on their distinct needs. The event is important because it convenes the entire cleaning industry in one place, allowing for those in charge of making decisions to learn about everything that’s on the market, educate themselves about cleaning, and network with like-minded leaders in the field. Many of the presentations from the Forum are now available online. More Events Coming in 2017! Please stay tuned as we finalize our plans for 2017. To be among the first to hear about upcoming events and more, sign up for our newsletter.